When I was a teenager growing up in Florida, our family was lucky enough to “borrow” a friend’s beach house on Point of Rocks, Siesta Key, Sarasota for a week or so each summer. Mostly, we’d just lay around, make our own food, take long walks by the crashing waves, lay on the sandy white beach, rinse off the salt-water under a fabulous out-door shower (something I’m bound and determined to have in my next house!). On occasion though, we’d become actual living human beings and venture out to one of a few restaurants we loved. The Columbia Restaurant on St. Armand’s Circle on Lido Key was one of our favorites. They have the most fabulously garlicky salad! Oh! To die for… So when I met my husband, it was with great pleasure that I learned his grandmother lived on Siesta Key, and (at least) yearly visits to Sarasota could continue. And so could the dinners out at the Columbia. On one of our early married visits, we were at the Columbia and I picked up a book of matches that had the infamous salad recipe printed inside. Heaven! And even though I’ve memorized the recipe, I still have the battered and stained recipe matchbook just in case… Oh, by the way, Rachel Ray featured the Columbia – and the 1905 Salad – on Every Day with Rachel Ray. So you absolutely know it must be divine…. 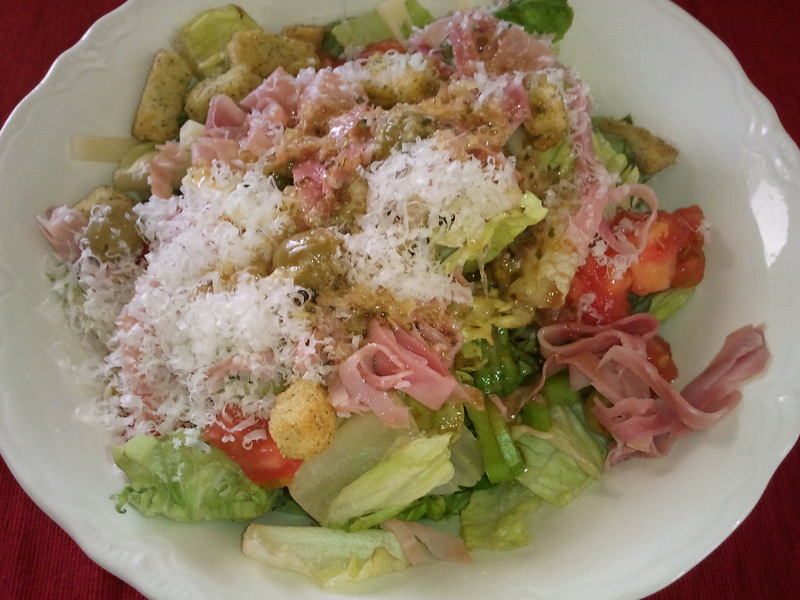 In a large bowl, toss together the lettuce, tomatoes, Swiss cheese, ham and olives. In a small bowl, whisk together the garlic, oregano and Worcestershire sauce. Gradually whisk in the olive oil, continually beating to form an emulsion. Stir in the vinegar and lemon juice and season with salt and pepper. Pour the dressing over the salad and toss well. Add the Pecorino, toss and serve. Serves 4.